Recently I visited Amritsar and tasted yummy vadiyaan. Bought a big bag back home and tried making this recipe. Loved it, try yourself. When oil is hot add ginger and green chilies. Sauté them on low heat, when ginger turns pink add bay leaf, cardamom. Turn to high heat now and add vadiyaan pieces and roast them. When vadiyaan turn golden brown add potatoes and let them fry. When potatoes are half done, then add onions and peas. Sauté them and add salt and red chili powder. Now add soaked rice without water and sauté them for 4 minutes. Now turn the gas to medium heat and add water. Stir with wooden spoon and add lemon juice. Cover the pan with heavy lid and let it cook. Serve hot with cold cucumber raita and vinegar onions or any kind of pickle. 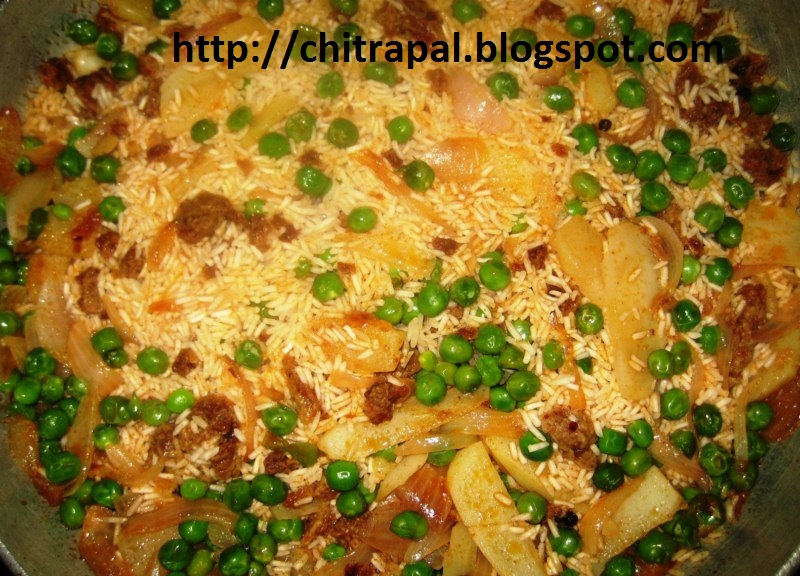 Amritsari vadiyaan pulao - I have yet to prepare it and taste- sounds scrumptious!! !Lets see!